When I’m not riding I like to: have some fun with friends, driving a karts and working around our Podmolbros FMX school. Something that most people don’t know about you: I like to drive a fast cars. Quote: every races in your live will give you something if they what you loose. Career History. How did you start riding? My career started when my brother gave me some video tape where was freestyle motocross, skate and bmx and that time I really liked Bmx racing so I did 3x czech champion title. My father was great enduro racer and my brother is world champion at fmx so in my blood was also that scent of gassoline, so I started with motocross and few years latter I started with FMX. 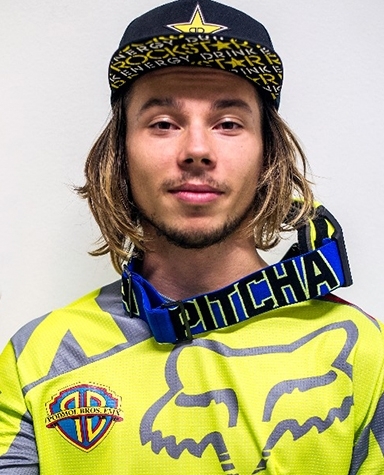 Career Honors, Awards, and Highlights: 3x czech champion - BMX, 10.place at world junior championship motocross 2013, Vice world junior champion of the nations motocross, 5x winner Best whip contest on world championship fmx, 4.place European championship Linz fmx, 6.place world championship Krakow fmx. Mere info findes på følgende sociale netværk.